I read Head Over Heels by Jill Shalvis a few weeks ago and I loved it. 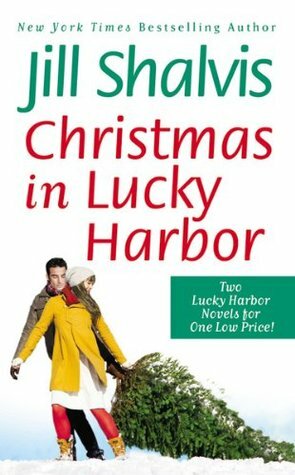 Christmas in Lucky Harbor is actually the first two books of the Lucky Harbor series, Simply Irresistible and The Sweetest Thing and I loved them just as much as Head Over Heels! Simply Irresistible, book one in the Lucky Harbor series, is about Maddie, a 29 year old who,all of a sudden inherits an inn along with two sisters from her late mother and she finds herself moving across states in the hope of restoring it. Shy, klutzy and mousy Maddie is a great heroine and start to the Lucky Harbor series and Jax is just absolutely perfect!The Sweetest Thing, book two, is focused on Tara and Ford as Tara tries to deal with her dramatic past and move on, but it's incredibly hard considering her ex is back in town trying to win her back and she's got trust issues with the one guy she wants most. All I can say is, Jill Shalvis worked her magic again. I found myself smiling,giggling,crying and even falling in love a little bit while reading this book! As usual, Shalvis has developed amazing characters and a sigh-worthy romance. Realistic, wonderful and completely charming, the Lucky Harbor series is an absolute must-read for any fan of the romance genre! All the three sisters are unique, relatable and wonderful heroines that you can't help but love. I cannot thank Grand Central Publishing enough for giving me a copy of all the three books of the Lucky Harbor series. I'm actually a little sad that with all the three sisters hooked up, there's no more Lucky Harbor stories left for me to read.